Home › Bahrain › Greece Today, Bahrain Tomorrow? Ramadhan is over, and now I’m back. We are always busy, that’s life, but busy and hungry is not good to transfer my thoughts into words for you all to read, so I took a break. However, this doesn’t mean that I wasn’t itching to tell you about how Bahrain, or the world for that matter, should look into the mirror when looking at Greece’s problems. Let me explain. 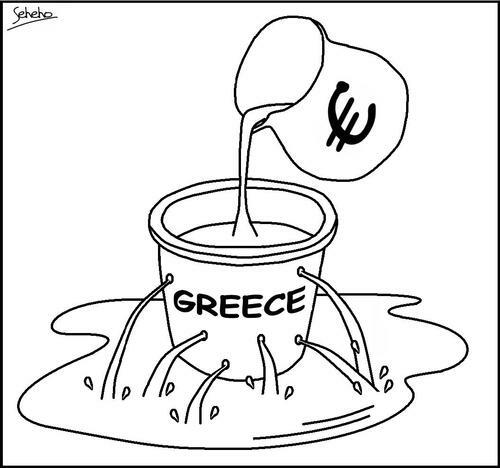 What Greece is going through today is very simple. They have been spending money and making so little in return, in comparison at least. So for example, the government would make money, through whatever means like taxation, and then offer its people all the money it made, and more from what it has borrowed, just to keep them happy. Here’s the thing, ask yourself this question, why was the Greek government spending so much on its citizens? Why did they lavishly accept early retirements and so much social benefits, when in reality it could not afford it? I know the answer, but I cannot tell you at this time, or else you’ll think that I am simply a person against the will of the ‘majority’ of the people, which I’m not. There is a failing system that is causing all these problems, and soon I will be able to tell you what government system I am referring to, but those with an eye can probably read between the lines. In any case, those who are elected in office in Greece care only about themselves. Like elsewhere, they want to get re-elected, and hence only think about the short-term benefits. So positioning the government on debt is not their problem, it is the problem of the future generations. They need to borrow more in order to satisfy all the promises they have made to the citizens that have voted for them. For Greece, like us all, they are in debt and needed to pay for the money they have appropriated. Fortunately for us, we don’t need to pay now, but our time will come because like Greece, we are spending much more than we are making. The difference, we are borrowing the difference each year and our debt is not getting smaller, actually bigger. The problem, or the failing system, that we are facing today is when we have decision makers only looking at short term benefits, or actually their own benefits as I like to call it. Hear what many individuals running for parliamentary seats are saying, promises and promises about how much more the government would spend on them in services. Parks, houses, roads, hospitals, schools, security, salary, subsidy, and much more are only but a few. It is true that the population is growing and that the government needs to spend more to make up for that, but not through borrowing money. What needs to be done instead, like what Europe and IMF are telling Greece to do today, is to create a ‘generator’ for the economy that would ‘generate’ money, instead of scrounging money. We in Bahrain pride ourselves by being the number 1 tax regime country in the world, when I actually see it as the worse income generator in the world. We offer so much and barely make any in return. We lack this ‘generator’ and in real need for it, we need to find ways to make money instead of simply relying on ‘natural resources,’ see Singapore, and various other successful nations. Let’s learn from Greece; let’s create an economic generator today, because tomorrow is very clear, it is not going to be good. ‹ Where Can I Sell My Legs? Sager, as you know, the US is in the same, if not greater, predicament than Bahrain. Our politicians are exactly as you say. This occurs more on the Democrats’ side but Republicans aren’t guiltless. It’s the natural fault of a democracy, once the people realize they can continue to vote those in that will spend lavishly on them…game over. In our lifetime the US will be Greece and then we’ll all be in trouble. Well written friend. Ramadan Kareem! I do agree with you to an extent. Tax is not the only solution. I believe we have a lot of loose ends in our system that is being abused. The focus should be on fixing these loose ends. Excessive employment in government, inefficiency, and corruption are major loose ends. In addition to tax fix these and on the long term you will have a much healthier economy. No matter how much you fix, you still need to be a partner in the nation’s generating wealth. What would land do if you can’t tap into what it makes? I think fixing these things are means to an end. Once you got these figured out you will have more FDI getting in which means more input into our economy and so on.